Do you remember being lovestruck? When butterflies swarmed your gut and goosebumps covered every inch of your skin and a wave of emotions swept over you? Do you remember? A similar effect awaits you at the installation titled ‘Afterimage of Love’ by Yumi Watanabe; a revisitation of feelings you may have once had. Afterimage is a non-specific term that refers to an image continuing to appear in one’s vision after the exposure to the original image has ceased. Positive afterimages replace and layer in hues similar to those of the original sight. They are often very brief, lasting less than half a second. However, a stimulus which elicits a positive image may also precipitate into a negative afterimage via the adaptation process. 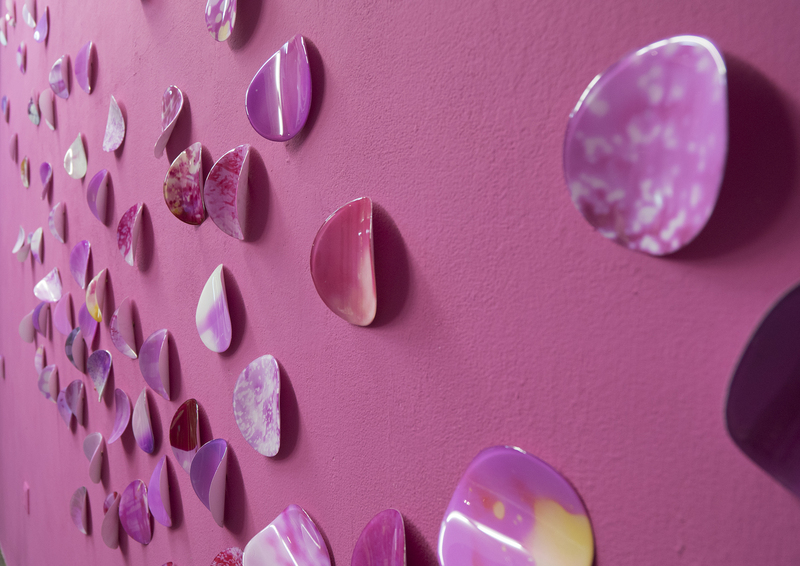 Carefully numbered to an exact 1001, flower petals romanticise the interior walls of the gallery. Artificial petals made of overpainted and laminated photos, each of which is anecdotal in both form and essence. The artist creates and furnishes these petals of “afterimage”, using a process connecting analogue and digital tools of photography. Reminiscing of a classical image of love as seen in movies, scattering petals everywhere, like in Sam Mende´s ‘American Beauty’, Yumi Watanabe is tracing petals of memory and leftovers of love. This ‘afterimage’ is the origin of Yumi Watanabe’s relentless search for her memory from the past. The memories appear in fragments, occasionally in an instant flicker, but they never cease to bloom into alluring blossoms. Fallen and scattered, they remain within ourselves and render the gradient from which we periodically analyse our situation. Delving deep into the struggling roles of history and memory, the perspective and personal interpretation of the artist provides a manual for understanding ourselves. The visitor is navigated by the artist towards the ‘haunting and activating’ qualities of memory. Art that engages with memory embodied in material and spatial conditions is examined alongside works that reflect upon memory’s effects through time. Contextualizing the role of memory in visual theory and aesthetic politics, Marcel Proust’s optics to Bernard Stiegler’s analysis of memory’s ‘industrialization’, this exhibition surveys the diversity of situations and registers in which contemporary artists explore memory as well. Yumi Watanabe was born and educated in Japan. Nowadays, she is a commuter switching between cultures and continents, dividing her time between her home country, Japan and her current base, Düsseldorf as well as in Tijuana, Mexico for producing parts of her work. She weaves diverse influences of philosophical and historical impacts and offers opportunities to experience those in her work. Yumi Watanabe is one of the most interesting and complex thinking contemporary artists at the moment, particularly because, she tries to combine and play with typical influences and their often unpredictable corresponding consequences.